I don’t know why I can’t erase my mind’s picture of the place. It comes less often than before, but when it does, it is more vivid, more deeply ingrained and yields to no neglect. I knew I had to go again. 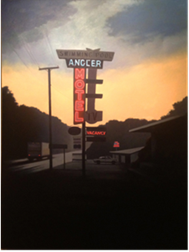 I came upon it first; it was the early sixties, its faded neon lights flashing Angler Motel at the top of the hill where it lay beneath a grey-capped, peach-sherbet sky. In the parking lot, pot-holed and graveled, I sat solitary in my car trying to decide whether I understood her invitation or if I was foolishly entertaining my inclination to fantasize. I followed her from the diner, her subtle invitation I inferred. I drove fewer than ten miles, lost her briefly when she topped the hill, and then almost driving past the place myself, I saw her tear-drop tail lights go dim. I followed, no less assured fate drew me there. Now I waited while she attended matters at the front desk. I didn’t know her. Or maybe I did. And there was something about this place; solitary atop the hill where lovers’ dreams born here, blow away, sucked up in the wake of speeding tractor-trailers and weary travelers rushing past, pressing on, opting for a better place. I was older now. Wiser too. Yet here I was again, transplanted amidst neon vacancies and croaking frogs, immersed in the wistfulness of Elusive Butterfly, whispers from the AM dial. Waiting. Wondering . . . when would she be here too? they condemn old oaks in sections and let them fall. the asphalt snake spews its venom on the winding trail. plugged ears and asses tightly stitched won’t find their seats.